OAKLAND, Calif. -- Golden State Warriors forward Draymond Green will play Monday night against the Minnesota Timberwolves after missing the past 11 games because of a sprained toe in his right foot. "Just excited to be back on the floor," Green said after Sunday's practice. "It's been a while since I really played basketball, so I'm excited." Warriors coach Steve Kerr says he's also excited to get his team's defensive stalwart back and is confident Green's presence will give the group another positive jolt. "He's the best defensive player in the league," Kerr said. "So I think our [recent] defensive efforts have reflected that, in terms of just not being as efficient, not being able to cover as much ground. But with that said, our Milwaukee game was our best defensive effort of the year. And so we know we're capable of defending without him, but we're just a lot better with him." Veteran swingman Andre Iguodala echoed those sentiments after Friday's victory. "When he's in the game it's just night and day," Iguodala said. "As far as trusting him. Those are my best defensive games, especially individual defense because I know where he's at, I know he's behind me. If he's not, he's talking continuously. That's something we're trying to get the young guys to pick up because that's a very special trait that goes unnoticed." While Kerr said Green wouldn't be on a specific minutes limit, the All-Star forward says he knows he isn't going to play heavy minutes in his return. After trying to fight through the injury early in the season, Green said he let Warriors director of sports medicine and performance Rick Celebrini dictate his rehab schedule. Green wanted to play in Friday night's win, but the Warriors have taken a cautious approach with Green's rehab because they don't want any lingering issues with the injury. "I tried it my way, it didn't work," Green said. "So I'm going to stick with your plan this time. Whatever you say, you won't get any pushback from me. And so that's what I stuck with the entire way ... no complaining from me. We did it my way once, it didn't quite work for me." Monday's game marks the first time since a Nov. 5 win over the Memphis Grizzlies that Green, Stephen Curry, Kevin Durant and Klay Thompson will all be on the floor together. "I pride myself on being the anchor of our defense, so [being] back on the floor, I hope it improves," Green said. "I feel like I'm being set up to go out here and get 170 put on our head [Monday], but that's what I take pride in. I like to view that as my side of the floor, being the leader of that side of the floor, getting everybody in the right spots. Or making sure I'm in the right spot and making plays on that side. Hopefully I'm some help on that side. Them boys made it tough for me to come back Monday after that defensive effort they put out there Friday." Green also noted that he still believes he can win the Defensive Player of the Year award this season, despite already missing 14 games. His mindset hasn't changed at all. "Hell no," Green said. "Kawhi [Leonard] beat me one year I think he played 56 games, something like that. So hell no, it's still on my mind. And I'm gonna get it done. I just got to come back and lock the league up. Which I'm more than capable of doing. I think I've proven that. So -- nope." 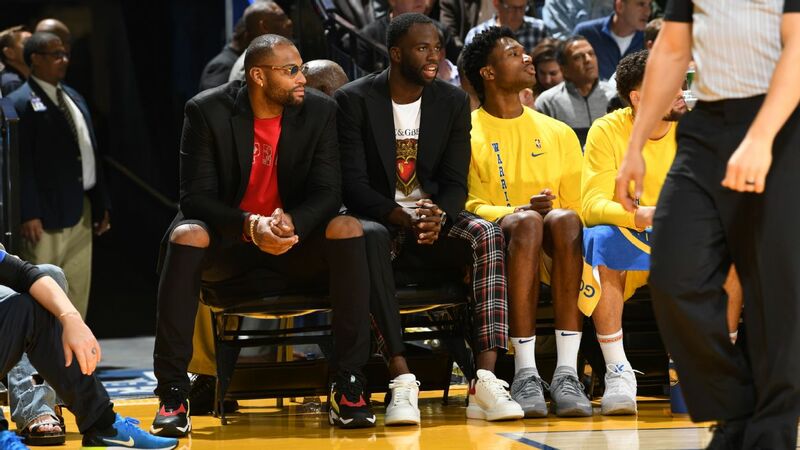 Meanwhile, injured Warriors center DeMarcus Cousins will practice with the G League Santa Cruz Warriors on Monday, sources told The Undefeated's Marc J. Spears. Cousins is clear to scrimmage and will be involved in any parts of practice he wants. Cousins has not played since January, when he tore his Achilles tendon while playing for the New Orleans Pelicans. The four-time All-Star averaged 27 points, 11 rebounds and 4.6 assists at the time of his injury with New Orleans and hasn't played in a game since. Cousins signed the midlevel exception with the Warriors during the offseason. Kerr has said that Cousins not only could be practicing with Santa Cruz soon, but could also be playing in a game in the G League. Cousins' brother, Jaleel, also plays for Santa Cruz.